Environmental sustainability is concerned with whether environmental resources will be protected and maintained for future generations. Long-term health of ecosystems. Protecting the long-term productivity and health of resources to meet future economic and social needs, e.g. protecting food supplies, farmland and fishing stocks. Intergenerational decision making. When taking economic decisions, we should focus on implications for future generations, and not just the present moment. For example, burning coal gives a short-term benefit of cheaper energy, but the extra pollution imposes costs on future generations. Renewable resources: Diversifying into energy sources that do not rely on non-renewable resources. For example, solar and wind power. Prevent the consequences of man-made global warming. Policies to ensure the environment of the planet does not deteriorate to a point where future generations face water shortages, extreme weather events, excess temperature. – All factors that could make living in parts of the world very difficult if not possible. Protection of species diversity and ecological structure. Sometimes medicines require elements within specific plant species. If some species go extinct, it limits future technological innovation. Treating environmental resources as if they have intrinsic rights and value. In other words, we shouldn’t just rely on a monetary value, i.e. we should protect rainforests because they deserve to be protected rather than using a cost-benefit analysis of whether we gain financially from protecting rainforests. Carbon tax – a tax placed on production/consumption of carbon – e.g. burning fossil fuels. The aim is to make users face the full social cost as opposed to just the private cost. Government regulation to limit harmful emissions. For example, some cities have promised to ban diesel cars by a certain date. Subsidising/encouraging more sustainable environmental practices. For example, moving toward renewable energy, like solar and wind power rather than relying on non-renewable energy sources which create pollution. Including all environmental consequences in the cost-benefit analysis of decision making. Shifting consumer/firm behaviour through persuasion and use of behavioural economics – for example discouraging the use of plastic tax. Traditionally economics has been more focused on the present moment – the short term. Classical economist such as Adam Smith and David Ricardo placed substantial emphasis on utility maximisation given the present choice between costs and utility of a decision. This reflected societies belief that the environment was there to be utilised for mankind’s benefit. In the nineteenth and early twentieth century, there was little concern over long-term environmental sustainability. 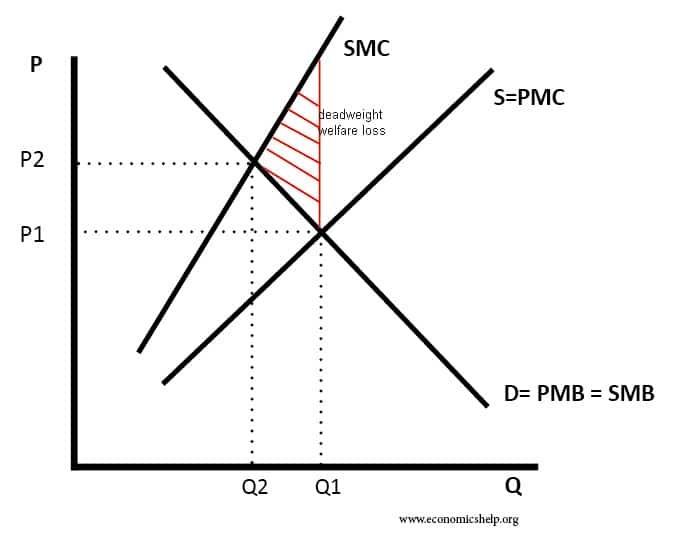 A diagram showing a good that has an external cost and therefore social marginal cost is greater than private marginal cost. However, with increased industrialisation, there was a slow awareness that production and consumption could cause significant external costs to the rest of society. In 1920, Arthur Pigou examined the concept of external costs. in his groundbreaking book The Economics of Welfare. Pigou used example of a firm building a factory in the city and causes external costs to the city residents – such as pollution, loss of amenities. It was an early attempt to broaden economics to consider impacts beyond the personal costs and benefits. By including external costs, it allows a framework to consider not just immediate external costs but also future external costs related to environmental sustainability. E.F. Schumacher placed greater emphasis on the environment in his book Small Is Beautiful: A Study of Economics As If People Mattered (1973). Schumacher was part of a new movement which questioned whether economic growth actually increased human welfare. 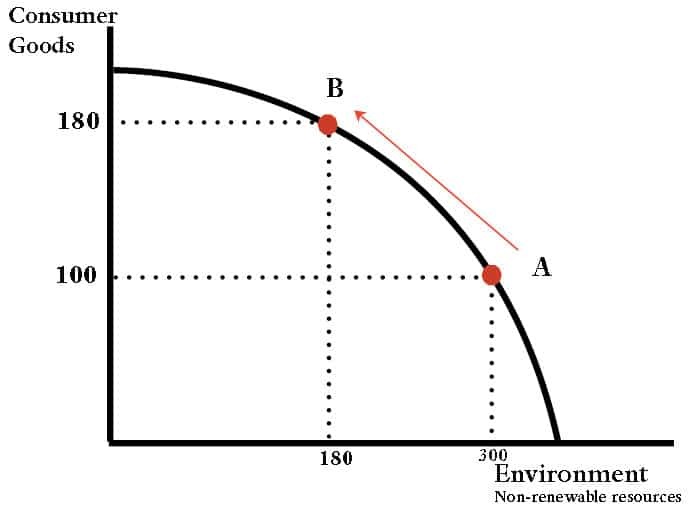 Environmental economics is an attempt to broaden neo-classical economics to include the environment in market decisions. For example, Pigovian taxes to reflect social costs. 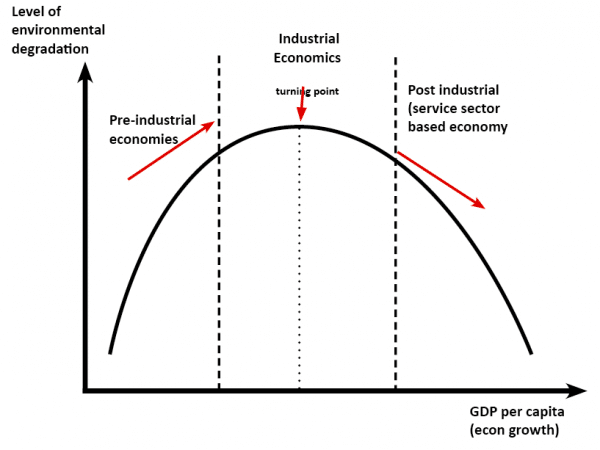 Environmental economics seeks to reform market forces. Ecological economics or Nature economics seeks to go beyond putting a commercial value on environmental resources but treating it as something more important than part of market forces. Natural services and the environment are of equal value to physical capital. This simple production possibility frontier PPF shows a trade-off between consumer goods and the environment (non-renewable resources). If we increase our consumption of consumer goods(non-renewable resources) then there is an opportunity cost of reducing the available non-renewable resources and it can reduce the long-term sustainability of the environment. A big debate is the extent to which economic growth conflicts with environmental sustainability. On the one hand – rising GDP and output leads to the higher consumption of resources, greater pollution and greater demand on natural resources. However, certain types of economic growth can still be compatible with environmental sustainability. For example, technological development has meant that in theory, we could generate power from renewable resources. Therefore, it may not be necessary to stop economic growth, but change economic growth, focusing on environmentally sustainable types of economic growth. Developing solar power – leads to both cheaper energy, economic growth and improved environmental sustainability. If there is a common area of natural resources (North Sea, land) individuals have a motivation to make use of the land to maximise their harvest. However, if several individuals maximise their yield of this limited resource, it can reach a tipping point where the fish stocks are no longer sustainable. Species of fish can drastically decline and even go extinct. For an individual fisherman, if he restricts his catch, then fish stocks will still decline. Therefore, there may be little incentive to reduce over-fishing, unless a common approach can be agreed. Economist Elinor Olson suggested that local people can voluntarily form local agreements to look after areas of shared resources. She pointed to areas of grazing in the Swiss Alps. However, this voluntary co-operation is harder for a shared resource between different nations. The European Union implement a Common Fisheries Policy to deal with issues of over-fishing in the North Sea. It was often unpopular, but fairly successful in managing over-fishing. Renewable resources. Resources that don’t diminish by being used. For example, a wind generator doesn’t reduce the amount of wind – it has no impact on future supplies of wind energy. 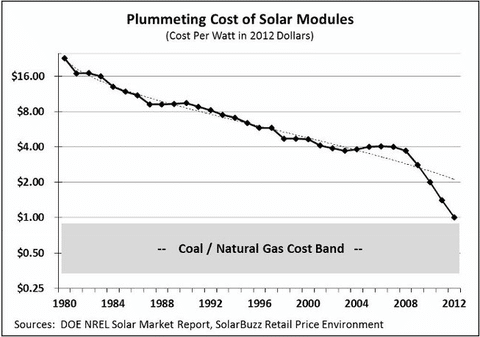 Similarly solar power doesn’t reduce the energy from the sun. Semi-Renewable resources. Some resources can be renewable if used in the correct level. For example, farmland should be a renewable resource. If crop rotation is practised, then there is no deterioration in the fertility of the soil. However, if the farmland is intensively farmed with use of artificial fertilisers and pesticides then the quality of the soil can start to erode. Studies have shown that the existence of trees can help keep the soil structure together. If all the trees are cut down, it is more likely nutrients in the soil get washed away. Nutrients and soil structure is slowly dismantled meaning that in the future, the soil will be less fertile. In some areas, farmland has become desert. Thank you Tejvan for helpful effort to collect present published sustainability-directed economic theory. Given this is where society needs to shift at speed and given it is – thus far – apparently contradictory to dominant Pelerin / neo-liberal/ libertarian- managed decades since 1970s, this is a vitally important conceptual and practical work. Valuable contributions.